Mr. Thavarajah was going to his residence after closing his office when the gunman riding a motorbike with an accomplice shot him close to the Thirukkovil STF camp. He was shot dead with a 9 mm pistol, according to Mr. A. Kariappar, Officer in Charge of Thirukkovil Police who is investigating the murder of the Sri Lankan government official. 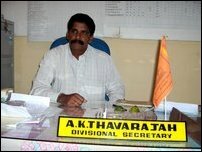 Mr. Thavarajah is from Cheddipalayam, 15 kilometres south of Batticaloa. He was settled in Kalmunai.